Co-working is the new path of melding life and work in a sustainable fashion. It is the global linchpin at the intersection of real estate, technology and community, which will shape the way we work in the future. What is co-working exactly? The term seems to have been used for the first time by entrepreneur Brad Neuberg to refer to the first shared office environment he established in San Francisco in 2005. After leaving his job in a tech start-up, Neuberg started to miss social aspects of office life. In a recent interview, he recalled: “I started asking myself, ‘Why can’t I combine the structure and community of a job with the freedom and independence of working for myself?’ He started renting a space two days a week and made it available to others. The concept soon took off in San Francisco and around the world wherever there are large groups of young independent minded tech workers or “digital nomads”, and it’s still expanding today. Co-working, the sharing of work facilities, by different individuals called “members”, is a dynamic response to the new ways of working facilitated by the internet and by the technological revolution that has given rise to new types of creative, knowledge work. New economic arrangements are emerging requiring more flexible workforces. There is also a generational and demographic dimension to this change, as millennials prefer more flexible working arrangements; valuing their freedom but also seeking engagement with like-minded people. Workers in many different industries can work virtually anywhere now, using their smartphone, tablet or laptop. For many businesses, especially start-ups, this can dramatically reduce overheads. Many large corporations are also exploring the benefits of outsourcing core activities to contractors, part-timers and freelances to cut costs and to increase efficiency. While the number of co-working spaces is growing dramatically, corporates are also trying to get on the co-working, collaborative office bandwagon. In April 2017, in a first deal of its kind, IBM signed a partnership with Wework, the co-working powerhouse. Under this this deal IBM will move 600 of its full-time corporate employees to a WeWork space in Greenwich Village, New York. WeWork will be responsible for managing the entire space for a single client, while IBM will benefit from all the benefits of an efficiently run co-working environment. According to HBR: “The real revolution in co-working may have less to do with freelancers or startups than with employees of large companies working beyond the boundaries of their organizations”. Dozens of corporates from disparate industries are experimenting with co-working and collaborative offices. This shift in working culture is having an impact on commercial fit out and office design. Fit out contractors are not only responsible for understanding the different ways people work today, including remote work and activity-based working (AWB), and cross-functional teams, but with anticipating the direction of the new collaborative workspaces and office fit out trends. Businesses are becoming more interested in creating healthy, productive, employee focused working environments because of the demonstrable impact on increased efficiency and profitability. For this reason, many companies are adopting some of the characteristic features of co-working spaces, like open layout work areas, work tables, hot desks, etc., alongside more conventional solutions – so that we see the emergence of hybrid office fit outs. Workers expect to work differently in collaborative offices and that has a direct and significant impact on every aspect of design, from the floor plan to fit out, from lighting to furnishing. Flexibility:The modern workforce is diverse, in terms of age, background and skill set. Even mainstream or “traditional” corporate set ups must integrate people working on different tasks and using different methodologies. This new office environment must be structured to accommodate diversity while fostering a sense of community. Flexibility and scalability therefore must be implanted in the office design and fit out process from the start. This may involve solutions such as moveable partitions or modular furniture and fittings, and so on. Layout:The new collaborative office or co-working space must include a combination and variety of layouts to accommodate different working styles and changing space requirements. 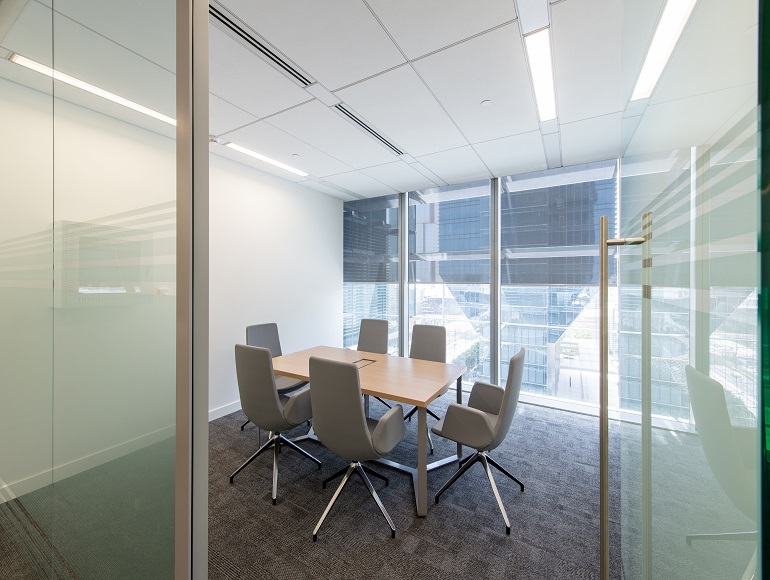 This may mean combining open plan with private areas, different sized and shaped meeting rooms and spaces for collaboration, as well as separate private working zones for individual and focused work. Hybrid solutions and design must be customized to suit the demands of each business. Design Diversity: Co-working spaces tend to cater to a young demographic. The millennial aesthetic is functionally attractive, colourful but not overpowering, working casual, but always professional. This means using deft touches of colour and texture in fit out. For corporates,this can mean using subtly shifting moods between more and less formal working areas. Kitchens and dining areas can be brightly coloured and funky. Individual offices and concentration zones can be quietly elegant. Technological Adaptability:The modern office requires seamless connectivity, providing internet access, and the most advanced telecommunication services, including video conferencing, virtual meetings, and more. Biophilic design: The integration of elements from nature improveshuman health and concentration. This includes plants, natural lighting and open window views. Breakout zones and Recreation Areas: One thing that has been learned from the co-working movement, is that people need time to decompress and recharge during the work Talking with colleagues or like-mined individuals can help with problem solving. Areas for rest, relaxation and brainstorming must be carved out because sometimes,the best ideas come up in casual conversations. New technologies have broken the chains binding the employee to a chair, desk, and PC. Many of us can now work anywhere at any time. There are two inter-related trends at play: the rise in the number of freelancers, entrepreneurs and digital nomads, looking for efficient and attractive co-working spaces; and the adoption by mainstream companies of co-working methods and collaborative office design. This is having a significant impact on corporate real estate requirements and on the demands put on the commercial fit out industry. The shifting economic landscape in the UAE has also encouraged more companies to explore new ways of cutting costs through using substituting full-time staff with freelancers or short-term hirers. This has helped to stimulate the local “gig” economy. UAE experts estimate that there are around 100 thousand licensed freelances working per project or on short-term contracts. There are already over 40 co-working spaces in Dubai alone to accommodate the growing number of freelancers, entrepreneurs and start-ups and this is influencing the entire fit out sector. Business managers and owners are recognising the benefits of providing more flexibility and agile working arrangements. According to a survey from Bayt.com, 86% of UAE workers seek a better work-life balance when considering new job opportunities. This implies that attracting and keeping better talent involves providing more flexibility in working hours and working space. Working in the UAE especially in the creative and knowledge fields requires companies to provide employees with more choices including flexi-working, remote working and co-working facilities and opportunities. High rental costs and lack of sufficient rental stock makes office space one of the biggest overhead items for businesses and can be an impediment to start-ups. This is one of the key factors encouraging entrepreneurs to look for co-working arrangements or to rent micro-offices. For larger companies and multi-nationals, collaborative working spaces and micro-offices can be an extremely cost-effective way to accommodate shifting business needs without have to undertake expensive office re-fit or restructure every time a new project is launched. Companies also see the benefits of relocating project teams to micro-offices, where only the space needed can be rented for exactly the time required. Co-working can reduce startup costs by up to 96% and can lead to long term savings of up to 40% compared to traditional office set ups. Summertown Interiors is always ahead of the curve on emergent office fit out trends. In previous posts, we have discussed on how to create agile and activity–based office environments and the positive impacts these environments have on employee engagement and productivity. We have also been among the first local commercial fit out contractors to develop co-working spaces and collaborative and micro-serviced offices. The Dubai Design District (d3) Business Center is a high-end workspace providing co-working facilities for contractors, entrepreneurs and start-ups. Space can be rented by the day, month or year. Summertown Interiors worked with the project managers from Tamdeen Group to create a unique working environment, combining communal areas with private individual offices. The Business Center incorporates a large public activity-based space with cleverly designed wooden terrace seating, trees and swings with abundant natural light. 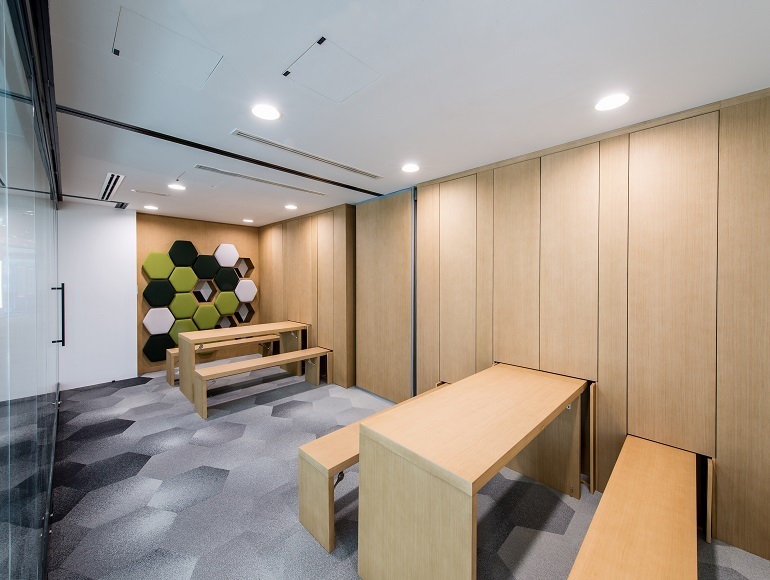 Hallways also have small semi-private work stations while a public collaboration room has folding benches and stools, as well as small micro-office studios to provide flexible working options. 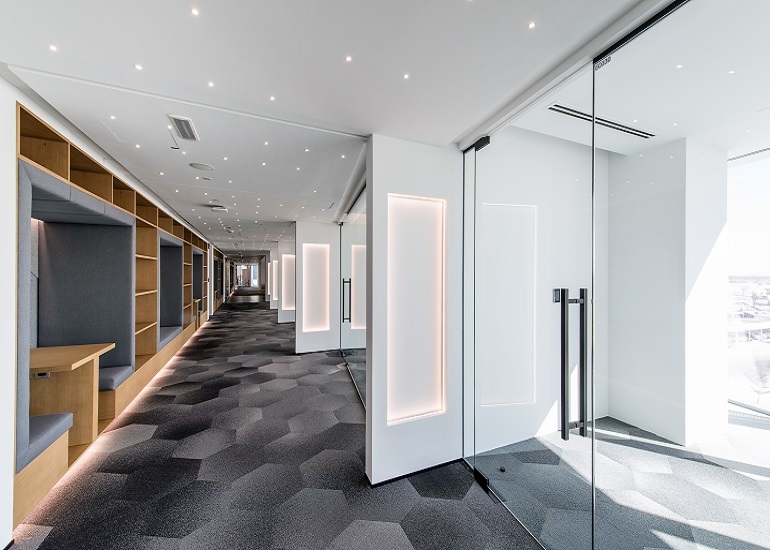 Located in ADGM Abu Dhabi’s financial free zone on Al Maryah Island, the recently completed micro-offices help start-ups and small businesses by providing smaller workspaces for rent. Summertown Interiors undertook the fit out of the new micro offices ensuring that the design is “simple, logical, clean and affordable”. Start ups and companies with under 10 employees now have a “plug and play” option facilitated by ADGM. They can start to work immediately after completing commercial registration and licensing procedures with ADGM. Summertown has over 20 years of experience in delivering quality fit outs including co-working and collaborative workspaces. We work alongside architects and design firms to ensure that all the trends and present and future needs of our clients are considered in a commercial fit out. We are also proud to have industry leading sustainability credentials and the widest experience of any our Dubai-based interior fit out peers, including LEED (Leadership in Energy and Environmental Design) Gold Certification and LEED EBOM for our own office. We stand apart from the competition because of our core values and our commitment to quality and sustainability. Contact us today to discuss how co-working and collaborative solutions can increase your competitiveness, improve your bottom line, and help you keep your employees healthy, happy and productive.